FILE - People walk through the Taylor Chevrolet showroom in Taylor, Mich., Dec. 28, 2017. Major automakers on Tuesday posted lower U.S. new vehicle sales in April as consumer demand continued to weaken and competition intensified following a lengthy boom for the industry. Auto sales have been on a bit of a roller coaster ride this year, with a weak performance in February followed by a jump in sales for some automakers in March. For years, U.S. consumers have been shifting away from traditional passenger cars in favor of larger and more comfortable pickup trucks, SUVs and crossovers. FILE - A 2018 Ford F-150 "King Ranch" pickup truck is displayed during the North American International Auto Show in Detroit, Michigan, Jan. 10, 2017. But the number of new models vying for a share of that market is growing faster than demand, threatening the fat profits automakers have enjoyed. 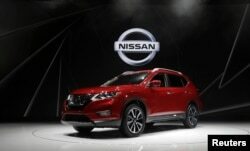 FILE - The 2018 Nissan Rogue is displayed at the 2017 New York International Auto Show in New York City, April 12, 2017. Despite rising fuel prices, KBB said prices rose more for SUV models than cars. No. 1 U.S. automaker General Motors announced last month that it would no longer report monthly sales and instead will just post sales on a quarterly basis. Industry estimates showed GM posting a range of sales anywhere from flat to down 8 percent for April. 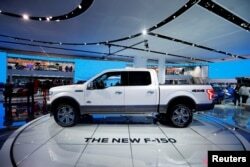 Ford said on Tuesday it will continue to post monthly sales. 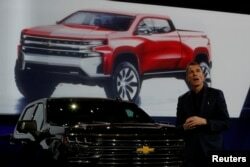 FILE - General Motors Global Design chief Michael Simcoe helps unveil new Chevy Silverado trucks at the North American International Auto Show in Detroit, Michigan, Jan. 13, 2018. Fiat Chrysler Automobiles (FCA) was alone among the top sellers in the U.S. market, posting overall sales increase of 5 percent in April. But retail sales to consumers were down 1 percent while lower-margin fleet sales to rental car companies and government agencies were up 5 percent. FCA's popular Jeep brand hit a record for April. But sales of FCA's Ram pickup truck were down 9 percent, though retail sales of the lucrative truck were up 3 percent. FCA said last week when it reported first-quarter results that it had encountered problems ramping up production of the new RAM 1500 pickup truck at its U.S. Sterling Heights plant. Toyota Motor Corp. posted a 4.7 percent decline in sales for April, with a 1.5 percent increase in SUV and pickup truck sales offset by a 12.7 percent drop in passenger car sales. Sales of Toyota's recently revamped flagship Camry sedan were down 5 percent. Honda Motor Co. said its April sales declined 9.2 percent, with car sales off 14.4 percent and pickup trucks and SUVs down 3.9 percent. Honda's all-new version of its flagship Accord sedan plunged 19.3 percent. In afternoon trading, Ford shares were off 0.3 percent, GM was down 41 cents or 1.1 percent at $36.33 and FCA was down 1.1 percent or 24 cents at $21.59.